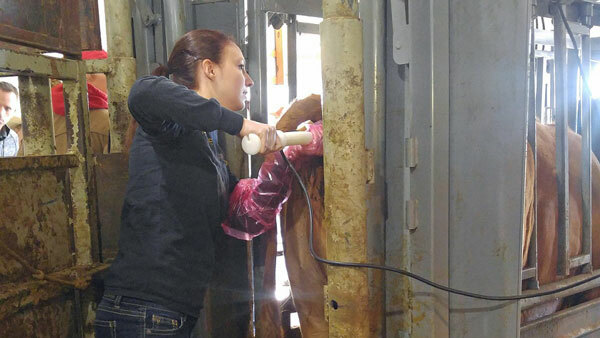 Pregnancy diagnosis is a very valuable tool in the beef industry. Photo courtesy of Troy Walz. Previous research has shown the benefit of pregnancy diagnosis and how it adds to a producer’s bottom line. Keeping one cow over winter can cost $100-$200 in feed and supplements so removing open cows can help decrease winter feed costs. Options for managing non-pregnant beef females are discussed in a BeefWatch article appearing in this issue. Pregnancy diagnosis is a very valuable tool in the beef industry and it is grossly underutilized. Only about 20% of producers employ some sort of a pregnancy diagnosis in their herd. Producers have options for pregnancy determination that vary in price and difficulty- transrectal palpation, transrectal ultrasound, and a blood test. All three options require a cow to be contained in a chute or alley for an examination or blood collection. Rectal palpation and ultrasound can determine pregnancy immediately while the blood test has a waiting period as the blood samples have to be shipped and processed at a lab. IDEXX Laboratories has developed a test that utilizes the same principles as a laboratory test, but results can be acquired in 21 minutes. This still may not be practical to certain producers as it would require a holding pen or separate sort. Other blood tests are available using BioPryn (BioTracking Inc.) or DG29 (Conception Animal Reproduction Technologies). These tests can be done in labs located around the country. They can receive your shipped blood samples and have the results back to you in a 24 hour turnaround time. The earlier a cow can be identified as pregnant or open the more beneficial it is in making a decision to keep, sell, re-breed, etc.. With experience, rectal palpation can determine pregnancy as early as 35-45 days pregnant. Ultrasonography can determine pregnancy even earlier from 25-30 days. Both of these methods can be very accurate, but the accuracy is highly correlated with the experience level of the technician. Blood tests will accurately (95-99%) determine pregnancy from as early as 28-32 days. For the blood tests to be accurate calving must have occurred at least 75 days prior so the hormones of the previous pregnancy have had time to disappear. It is important to realize that pregnancy diagnosis prior to 40-50 days bears risk of greater pregnancy loss due to the stress caused by the pregnancy diagnosis during the fragile stage of early pregnancy. Prices can vary greatly between veterinarians and laboratories. Processed blood tests are generally $2.40-$3.75 per cow. This depends upon the volume of cows and cost of tubes/materials along with running the tests. The IDEXX tests are in that same price range depending upon how many cows you will be testing. Palpation and ultrasound will be very similar in price depending upon the hourly rate of the veterinarian and their rate of cows checked per hour. With a small number of cows expect a higher rate that can be upwards of $4 per cow, but with larger numbers of cows you can expect that rates will be less. Consulting your veterinarian and asking questions about cost, time, and what they prefer will help you make an informed decision as to what method will be the most cost effective and accurate to determine the pregnancy status of beef females in your herd. *Identification of names of companies in this article is not intended to imply recommendation or endorsement of these products.